Hello readers! Welcome back to the next edition of The Curious Column, a space I’ve dedicated to reach out, question and get wonderful, actionable advice on your favourite topics from people I look up to and are super passionate about their blog and work. In today’s post, I got to talking with Rutuja, one of my oldest readers who since then has become a force of her own. I have watched her as she joined multiple groups on curly hair and her curiosity soon led from posting questions to offering advice. I always admire people who are hungry to learn and are happy to teach that back to others so it empowers more people. Rutuja is one such person. 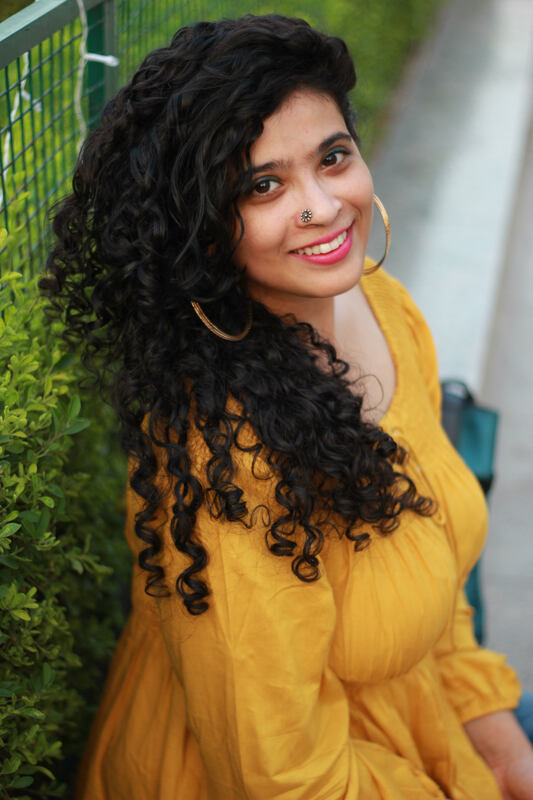 Since she is also a college student, she has some excellent advice for curly people in India on how to slowly start a routine with a tiny budget. If you’re confused about trying the CG Method or what products to get, keep on reading! 1.1 How did your curly hair journey start? What were your thoughts about your hair before it? 1.3 You were Non-CG for a long time before switching to CG- Why did you shift & what is the difference in your hair? 1.4 What is your curly hair routine now? 1.5 What are your top budget-friendly products in India that people with a tight budget (especially those living on pocket-money) can get? 1.6 Name your favourite hair product, barring any price limit. 1.7 Are you a DIY-er? What are your favourite DIY hair masks or recipes for curly hair which you love? 1.8 To an Indian curly/boy girl – what are your top 3 tips on starting their curly hair journey? 1.9 What is your curly hair pattern, density and porosity? Has that prevented you from using certain products? 1.10 Goa, where you stay is known for it’s humidity. What are your top tips for girls living in high humid places? How did your curly hair journey start? What were your thoughts about your hair before it? I used to watch curly hair videos on YouTube but never gave it a try seeing how expensive those international products were online. Then once I saw my friend Sania Lewis’s story on Instagram (she was on modified CG at that time), got curious about her curls and asked her a few questions. Everything she told me shook me a little, like not brushing hair dry, detangling in the shower itself and all that jazz. She then recommended me to follow you on Instagram. I guess that’s where it all started. I went through all your posts. While doing that, I found other blogs of curly hair bloggers too. As CG method at that time seemed complicated to me as a beginner, I started with non CG products and a few techniques like detangling with fingers, deep conditioning and applying leave in conditioner. That’s when it hit me that even my frizzy mess could look good. I started my CG journey on 1st October 2017. Initially, my hair was frizzy and it took my curls a few washes to adjust. And now they are clumping way better, are less frizzy, and don’t feel weighed down! No turning back now. You were Non-CG for a long time before switching to CG- Why did you shift & what is the difference in your hair? I did feel CG was bit complicated so in the beginning, all I did was, adopt the techniques in the routine, like finger detangling in the shower, squishing, raking in, praying hands and plopping with the non CG products. I used to use bblunt products and they were huge bottles so had to finish them. But this way, before turning to the CG method, I already knew which techniques suit my hair better. What is your curly hair routine now? Condition: Matrix Hydra Source Masque. It’s great for detangling. Deep Condition: If I want to deep condition with a DIY hair mask, I detangle with Matrix Hydra Source Masque first, rinse it off and then apply the DIY hair mask since DIYs dont always have great slip to detangle. Otherwise I use the masque alone. I use rice water rinse after this step sometimes to maintain moisture-protein balance. I keep it for 5 mins and rinse it off with plain cold water. Coming to styling, I part my hair in two sections. This works for me better than styling head upside down. Leave-in-Conditioner: Diluted Loreal Paris Smooth Intense Conditioner. Curl Cream: Cantu Curl Activator. This is a recent addition and I use a very small amount. Technique: Raking in and distribute with the Denman brush. (Again I do get similar results if I skip curl cream). Gel: my hair LOVES gel. It can’t survive without it and my hair gets frizzy if I skip it. And as I’m DIYer I use FSG (Flaxseed gel). It’s really tricky to use it so I apply it with praying hands, then scrunch up with t-shirt and follow up with Schwarzkopf Taft Marathon Looks Gel with praying hands technique for stronger hold. Plopping! I plop with a t-shirt. I swear this helps a lot when you have to dress up and do your makeup and you can just have all your hair away from your face without disturbing them. What are your top budget-friendly products in India that people with a tight budget (especially those living on pocket-money) can get? I’m a 19-year-old college student so yes, I’m not earning at this point which is the reason why I try to search for affordable options and depend on DIYs. My hair looks healthy and curly with them so I don’t feel I really NEED international expensive products. Of course, they are going to have better ingredients and formulation, but if you’re on a budget, then yes these won’t disappoint you and would work really well. Taft gel (Rs.395) for hold! Name your favourite hair product, barring any price limit. Definitely the Yves Rocher Nutri Silky Mask. It doesn’t have a good slip and it didn’t feel like I was applying a hair masque at all but the results were mad amazing. Are you a DIY-er? What are your favourite DIY hair masks or recipes for curly hair which you love? And other essential oils like lavender and peppermint. I usually use banana as the base to get that thick consistency and then add other ingredients as per my liking. If I’m really lazy then all I use honey and banana with few drops of evoo, jbco and essential oils and it works great! 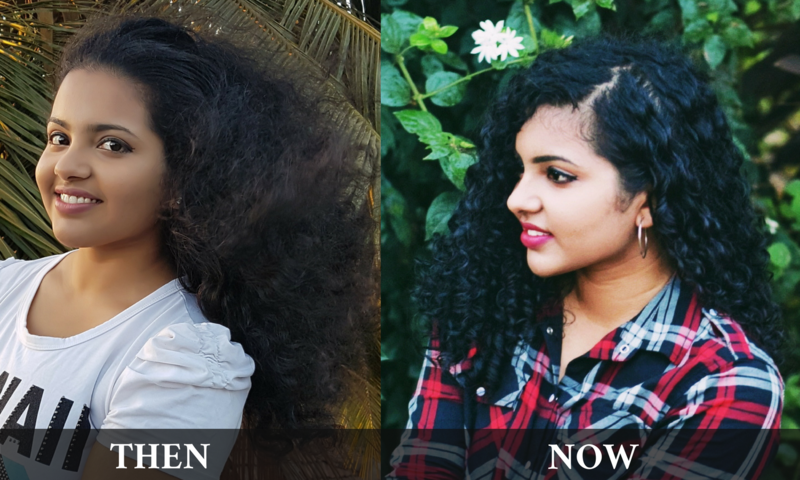 To an Indian curly/boy girl – what are your top 3 tips on starting their curly hair journey? Firstly, skip combing hair dry. Till now I’ve turned 3 of my friends to CG/modified CG and they had crazy reactions when I told them skip combing/brushing. You have tortured your hair enough with those harsh bristles, now let your mane be the way it should. Next up would be using a leave in conditioner. Curly hair is thirsty for moisture and you just can’t leave it like that after your shower. If you’re confused, just use any conditioner diluted as leave in conditioner. That’s what I did. Then slowly I kept adding things in my styling routine. And lastly deep condition. So many ingredients in your own kitchen which could be applied on your hair and your hair would love it even more than your taste buds do! What is your curly hair pattern, density and porosity? Has that prevented you from using certain products? My hair is a love child of 3A and 3B hair type. I have medium density and medium porosity. And I have really fine hair. When my hair is wet I feel I look like Lord Voldemort. I don’t think this has prevented me from using any products. But yes it’s always better to mix your styling products on your palm to check whether it could give flakes. Products work differently in different seasons, humidity levels etc so that’s what I’ve started doing recently. Goa, where you stay is known for it’s humidity. What are your top tips for girls living in high humid places? I’m very wild and free when it comes to humidity. No matter what, it’s gonna get messy somehow. I usually just use rose water to refresh these days or sometimes I go extreme by making my hair full wet, detangling a bit with fsg, air drying and sotc if I have enough time! And done! Did you like it? Want more? Then don’t forget to follow this incredibly sweet, gorgeous woman on Instagram. You can also join the Facebook group – she is very active in answering queries posted there. You can also check out more incredible women that I’ve spoken to for this column here. This post contains affiliate links which means, if you buy these products through these links, I earn a tiny commission at no cost to you. It is the only way I can earn from my side hustle and buy more jalebis to keep me working late into the night for you 😉. Now, I’m off to work on my next Youtube Video and blog post! Till then, you can take a sneak peak into my life on Instagram @thecuriousjalebi. Oh wow, her story has really resonated with me, since I’m a college student as well, albeit with type 2 waves. I’m on modified CG, but I can attest to the skipping brushing hair dry thing. My mom objects, but even she has to admit, my hair has never looked as defined and as amazing in a ponytail as it does now. I feel like people get turned off to the skipping brushing because they believe that not brushing your hair will cause tangles and issues. We’ve been told to keep our hair tangle free, and we follow that. But those of us who took the plunge know that the tangles won’t be there, if you use a good conditioner and fully saturate your hair with it. I’ve stopped using a brush to style my hair, and when I need to put a ponytail, I can simply use my fingers to gather my hair up. I’m just waiting to make the final move to CG with my styling product. I’m currently using the BBlunt Anti-Frizz Leave in cream which is a silicone based product, although it has defined my waves to no extent. I’m just using it up, and then I’ll invest in the Arata Hair Cream, which is just around 50 rs more or so. I’m still a bit apprehensive of gels, but if I feel like I need hold, I might go for the Taft gel. I’m glad you liked her post. Modified CG is fine – I am on it too since I use a medicated shampoo now and then for dandruff. And yes, people end up thinking we never brush our hair but it’s just we do it wet with product and not dry! Arata hair cream is quite nice! As for gels, start with DIY Flaxseed gel to see how comfortable you are using gels and what results you can get! For the anti frizz leave in, it’s heavily silicone based, so if you’re trying to go cold turkey, it won’t be a good option. However, it was the first styling product I used that showed me that I could get definition of I just added an extra step to washing and conditioning. I highly recommend it for those people who have never used a styling product before. And I made the switch! Also tried squish to condish along with the Arata Hair Cream and my waves have never looked better! Also, what do you think of the Ustraa Hair Cream? At just 200 rs it sounds like an amazing cg cream since its almost impossible to find good cg creams under 500.